The sun has continued its string of outbursts this week, unleashing two new, powerful solar flares in two days from a region on its surface that space weather experts have now dubbed "Old Faithful." 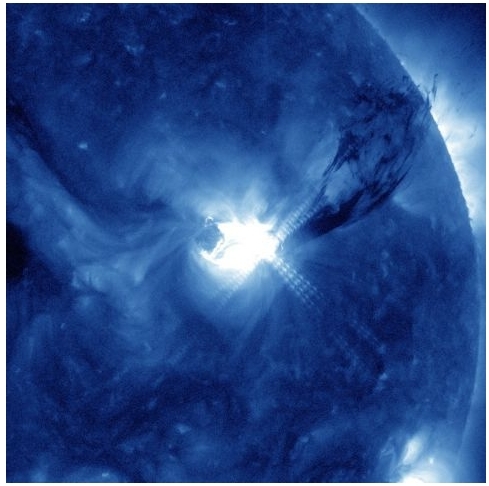 An X-class solar flare — the most powerful type of sun storm — erupted Wednesday (Sept. 7) at 6:37 p.m. EDT (2237 GMT). Another flare blazed up today at 11:44 a.m. EDT (1544 GMT). The latter flare appears to be somewhat less intense, but scientists are still taking its measure. Because of its recent string of powerful flares, space weather experts at the National Oceanic and Atmospheric Administration dubbed sunspot 1283 "Old Faithful," comparing it to the well-known geyser in the United States' Yellowstone National Park that goes off like clockwork. Strong solar flares are classified according to a three-tiered system: X-class flares are the most powerful, M-class are of medium strength and C-class are the weakest. For the record, sunspot 1283 has now generated an M5.3 flare (Sept. 5), an X2.1 (Sept. 6), an X1.8 (Sept. 7) and an apparent M6.7 (today). The eruptions on Monday, Tuesday and Wednesday all produced CMEs, scientists said, though it is too early to tell with today's storm. But the three known CMEs shouldn't cause major problems on Earth, they added. "Not one of the CMEs, however, will hit our planet squarely," the space storm monitoring website Spaceweather.com wrote in an update today. "Glancing blows from the three clouds will commence sometime on Sept. 9th and continue through Sept. 11th, possibly sparking minor geomagnetic storms." These CMEs could prove a boon for skywatchers, possibly producing extra-dramatic light displays (called auroras) in certain locations when they do collide with Earth. The powerful storms of the last four days are part of a larger pattern. Solar activity has been ramping up over the last few months as the sun has roused itself from an extended quiescent phase in its 11-year activity cycle. Just last month, for example, the sun let loose with an X6.9 solar flare, which was the most powerful solar storm since December 2006, NASA scientists said. The sun also generated an X-class flare in February and another in March. And the storms should keep coming over the next few years. Scientists expect activity in the current cycle — known as Solar Cycle 24 — to peak around 2013.